Any time, any place, any pace. and earn CE credit on-the-go. Download the FREE MinuteCE app! MinuteCE is an online resource offering a wide range of accredited and unaccredited programs in a variety of medical fields. Learn wherever you are, whenever you’re ready, and on any device. Programs are broken down into modules that are 5 minutes or less. After viewing each short module, you can complete a brief test to earn your credit. Whether you are a nurse, physician, dietitian, or pharmacist, every minute you watch can be applied towards your continuing education credits. 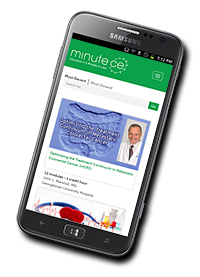 Minute CE® - the first patent pending CME/CE banking system to deliver short educational video episodes that fit into your busy schedule - is now part of MedEd On The Go. SIMPLY A SMARTER WAY TO LEARN. Quiz Challenge - compete against your peers! to begin using our expanded educational platform.